The Orchid Column: Where do I cut my Phalaenopsis after it blooms? Where do I cut my Phalaenopsis after it blooms? Where do I cut my Phalaenopsis spike? is on the short list of frequently asked questions at the Fuqua Orchid Center. Yes, it's sad to say goodbye to your Moth Orchid spike. A year is a long time to wait for more flowers. But you don't have to wait an entire year. If you remove the spike in the right location you can produce a second flush of flowers from the same spike in a few months. It's easy! 1. Choose a clean sharp cutting tool. 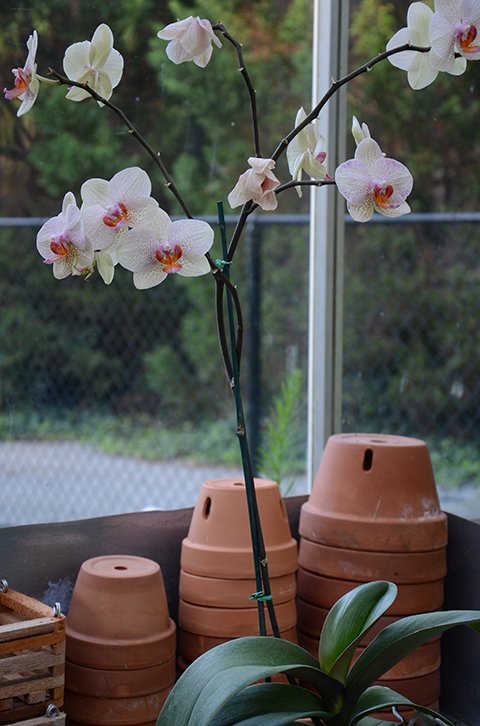 See my earlier post on cutting tools for orchids if you're wondering what tool to use. 2. 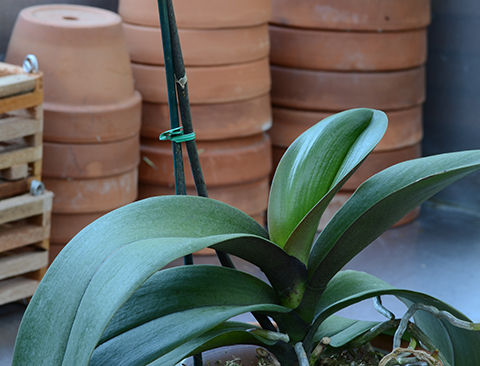 Take a close look at your Phal spike. You will see a series of beige bands (called bracts) that encircle the spike at approximately 5" intervals. In the photo below one bract is visible just above the green twist tie. See where the beige bract widens and becomes shield-shaped? Beneath that protective bract is an inactive bud. By cutting the spike just above that bud you remove the inhibitory hormones that are holding the bud's growth in check. The cells inside the bud then differentiate into a flower spike. In a few weeks you will see the new spike begin to elongate. 3. Make the cut. Holding the spike securely with one hand, make your cut about one quarter inch above the beige bract. 4. What now? Hang onto your bamboo stake as you will need it to stake the elongating spike once it is about eight inches tall. Sometimes the bud produces a small plantlet, or keiki, rather than a new flower spike. After the young plantlet has produced a couple of roots about three inches in length before you can remove it from the old spike and pot it up. If your plant is weak or in need of repotting, it's best to repot and allow your plant to rest and recuperate this summer without the additional strain of producing a second spike. Don't get too excited thinking that all of your orchids will produce a second flush of flowers in this way. Not true! Only a few--some Epidendrums and Oncidiums--do this. 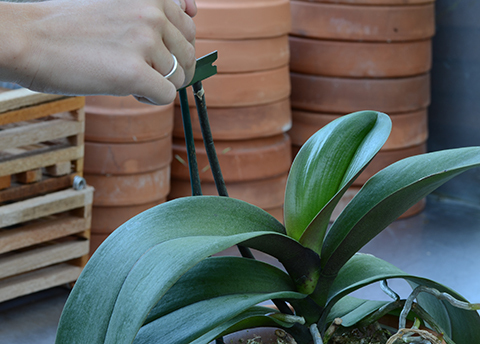 Wondering where to cut your Oncidium spike? You can find out here. Click here to find out where to cut your Dendrobium spike. To find out where to cut your Cattleya spike, click here. Recently, my wife bought some succulent house plants as part of our home decor. I really love how she manage to arranged and compliment the plants with the way our house looks like. Now, what I am suggesting to her is for us to buy some orchids that we can put on our garden. What if I cut the bloom spike clear to the base of the plant, Will it ever bloom again? It is ok to cut the spent spike all the way back. When the orchid puts out a new flower spike in the Fall, it will be in a different spot on the plant. Did you ever find out if your Orchid will bloom again if cut at the base? thank you for the great post! I have yet to have a bloom come from a cane cut slightly above the beige shield. But maybe that was because I used scissors, rather than a sharp blade? Today I surgically removed an extensive spike (with multiple off shoots), using a razor blade. I am anxious to see if I have success! I have gotten new shoots with blooms in the past, but only from the base of the plant. Again, thank you! I followed your advice closely, including the razor blade, and it worked perfectly for me. The new spike grew slowly but steadily, and now, almost a year later, I have six magnificent blooms. Thank you! I am wondering, when this spike dies, can I just keep cutting above the next bud down? Or at some point, should I let it rest? I received an orchid for Valentine's Day this year. It was in bloom when I received it and stayed that way for three months. When the flowers dropped I trimmed the stem back as you instructed above. Much to my delight it bloomed again just this week. I would also like to know the answer to Carolyn's question above, how many times can you cut it back to the next "band"? Will a new stem begin to grow from the base of the plant? This is my first live plant and I would love to keep it healthy and blooming for years to come. Thanks in advance for any advice you have! I received a Phal orchid in August 2014 when my son died. It just dropped it's last bloom this week April 2015, but it has a new shoot with 5 buds on it. I don't know whether to prune it now or what. Can anyone help me? Just wondering if I cut my flower spike/ stem at the base of the plant, just above the soil, will my orchid flower again? I have a mini moth orchid.